Centre for cyanobacteria and their toxins: Cyanobacteria? What is it? Aquatic environment is thought to be a "cradle of life on Earth". One of the oldest organisms colonizing water were, according to various developmental theories, microscopic cyanobacteria and after them advanced organisms, algae. Both these forms of life have survived until now and they form a so-called phytoplankton, i.e. a community of microscopic water organisms ("plankton"), in this case organisms similar to green plants due to an ability to run photosynthesis ("phyto-"). The aim of this web presentation, developed as an attempt to summary the most important information from an array of information sources, is to delineate what these organisms are and why it is important to deal with them. What is the difference between algae and cyanobacteria? Let's start from the developmentally younger group. According to actual taxonomic system algae belong to eukaryotic organisms from Plant Kingdom, in contrast to cyanobacteria, which are prokaryotic organisms from Bacteria Kingdom and were classified earlier as algae due to their similarities (occurrence in water, green colour, etc.). Algae are a diverse group of lower plant organisms without a common ancestor. They can be one- or multi-cellular and highly different in size. Microscopic algae smaller than 1mm can be found in phytoplankton, macroscopic multi-cellular algae, like seaweed and brown algae, can be a few meters long. Both algae and cyanobacteria are studied by phycology. Fig. 1 Illustration of a variability of green algae. Algae are photo-autotrophic (only seldom heterotrophic) organisms able to run photosynthesis and their main function in ecosystem is a primary production of organic mass. Chloroplasts of green algae originate most likely from so-called endosymbiosis with cyanobateria, diatoms and brown algae have secondary chloroplasts originating from endosymbiosis with red algae. Algae can reproduce both sexually and asexually (by cell division). They exist like single cells and/or few-cell colonies of various shapes, bodies of multicellular macroscopic species can resemble higher green plants. But in constrast to them these big algae do not have typical plant organs like roots or leaves, therefore their body is called frond. Algae are found in a wide variety of habitats including sea or fresh water, soils, snow, tree bark and other surfaces and in symbiotic relationships with other organisms such as fungi (lichens) or simple animals (Cnidaria) forming corals. They can be free-floating in the water (planktonic) or attached to some substrate (periphytic). The oldest discovered remains of algae are thought be cca 1.7 milliard years old. From human's point of view algae can be used in many ways. They are used to make agar, gelatine-like staff usable in food industry or as a laboratory medium for bacteria growth. Polysaccharides alginates are extracted from brown algae and are used in medicine, food production, or biotechnologies for e.g. cell encapsulation. Algae mass is used even in production of biofuels or fertilizers. Silicate-containing cases of diatoms, so called diatocemous earth or diatomite, when impregnated by nitroglycerine, were used as a component of dynamite. Pigments from algae can be used as alternatives to chemical dyes. And some kinds of algae serve as food, mostly in Asia, rich in vitamines and unsaturated fatty acids. Cyanobakteria are microscopic photo-autotrophic prokaryotic organisms able to run photosynthesis. Sometimes they are called blue-green algae due to their blue-green colour, but it is not exact because cyanobacteria belong to gram-negative prokaryotic bacteria and algae are eukaryots. The name is probably derived from greek word cyanos (blue). They are probably on of the oldest organisms on Earth (fossil remains are up to 3.5 milliard year old), which are able to survive in nearly all types of biotopes. Probably they originated from anaerobic photosynthetic bacteria, like todays purple bacteria. In Cambrian (cca 600 million years ago) cyanobacteria were dominant organisms on Earth. In this period also a content of oxygen in atmosphere started to rise as a by-product of oxygenic photosynthesis. According to some researchers cyanobacteria played the most important role in constitution of oxygen-containing atmosphere and the todays world at all. In most of lakes, dams or ponds cyanobacteria occurr during the whole season as a natural component of phytoplankton community. 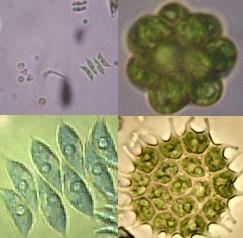 Nowadays a few thousands of cyanobacterial species from approx. 200 genera is known. More information about the taxonomic system of cyanobacteria you can get from web of Phycology lab, Dep. of Botany, Faculty of Science, University of South Bohemia, České Budějovice http://www.phycology.cz/. Cyanobacterial cells vary in size from less than 1 micrometer (µm) in diameter to greater than 20 µm in length. 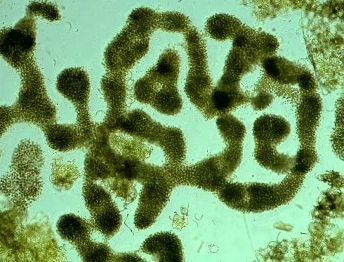 Cyanobacteria may be single celled or form filaments or colonies or even complicated frond-like bodies. Some colonies made up of single cells may reach greater than 100 µm in diameter. Some colonies or filaments form irregular shapes; while others produce mucilaginous sheaths surrounding the cells. Nitrogen fixers or Heterocysts . Heterocysts are gas tight and anaerobic, and contain the nitrogenase enzyme. Using the energy from ATP, this enzyme enables the cell to convert gaseous nitrogen (N2), from the atmosphere or dissolved in water, into ammonium (NH4+), which is important e.g. for amino acids production. Resting cells or Akinetes . Akinetes may be released by vegetative cells or attached to filaments. The cells function as an asexual resting state capable of resisting harsh environmental conditions (winter) and can germinate to form new filaments when conditions get better. They are formed from one or by fusion of few vegetative cells. Is it safe to swim in water with cyanobacteria?